Many people become totally frustrated when trying to grow aquatic plants because they only seem to last a month or two before the leaves fall off and the stems begin to rot. Some people even think this is the normal way of growing plants in the aquarium! Not so! Any plant if grown under the right conditions can last for many years! The most critical thing for continued plant growth is lighting, which is also the chief reason why plants fail in the first 30 to 60 days. Plants require a certain light intensity in order to generate photosynthesis and grow. Over-fertilization does not make up for poor lighting, neither does extended light periods. For all tanks but very small ones, the lighting that comes with standard aquarium set-ups is inadequate. Plant species fall into three general light categories: low light level, moderate light level, and bright light level. Light intensity is measured in lumens, but to simplify things a general rule of thumb of watts per gallon has been established. Low light is considered to be a minimum of 1.5 to 2 watts per gallon of water, while bright light levels are 3 or more watts per gallon of water. Moderate is somewhere in between two and three. Shallow tanks such as a ten gallon can get by with less. Stem or "bunch" plants which are cuttings, require a bright light in order to take root and grow. Most however are extremely fast growers with the right amount of light. Many rosette or rooted plants such as Swords require either moderate or low light levels. 3 watts per gallon! How do I get that many light bulbs over my tank? Tanks under 55 gallons can be a challenge. There are fluorescent strip fixtures made for the aquarium that can sit on top of a glass cover. Cheaper alternatives are fluorescent cabinet or shelf light fixtures, and for 48" long tanks you can use dual tube 48" shop-light fluorescent fixtures that run around $8 at local hardware stores. Another alternative is high intensity lighting such as VHO fluorescent and Metal Halide. VHOs are around triple the wattage of standard fluorescent and require a special ballast that can handle the high wattage. VHOs give an even light displacement across the tank, and run cooler than Metal Halide. Metal Halide is a high wattage spot light that can attach to a wooden hood or hang suspended above an open tank. Each bulb covers about a four foot square area. They generate a large amount of heat which needs to be ventilated by fans in a closed system. MH comes in the following wattages: 70 Watt, 100 Watt, 150 Watt, 175 Watt, 250 Watt, 400 Watt, 1000 Watt. Not all of these wattages may be available in a full spectrum. Since this article was originally written, power compact fluorescents have advanced and become the most preferred choice for upgrading lights. These U-shaped bulbs are brighter than standard fluorescents, but are much more compact in size, allowing much higher wattage/more intensive light to be used in small places. Retrofit kits can be attached easily to a homemade hood or canopy. The typical ballast powers one or two bulbs, and is small enough to hide away easily. Standard size PC bulbs are 9 watt, 13 watt, 28 watt, 36 watt, 55 watt, and 96 watt. Customsealife has come out with a 65 watt bulb. The term Kelvin designates the color spectrum of the light bulb. A "full spectrum" bulb is anything between 5000k and 6500k. This has nothing to do with brightness, and bulbs that are very high in the color spectrum, (10,000k) have no value to plant growth. Standard fluorescent, VHOs, and MH all come in full spectrum. This issue should be taken into account while planning your set up. Dark hiding places, dark gravel, dither fish, and tall plants providing shade will help to comfort shy fish such as Apistogrammas and Discus in a brightly lit tank. "Intensive light creates a higher photosynthesis rate in plants then does moderate or low levels of light. OK, basic botany, Plants use light and CO 2 to create sugars via photosynthesis, they use the sugars and O 2 for respiration, synthesis, and growth. For some reason higher plants retard respiration and growth in tissues that are actively photosynthesizing, (ever wonder why a plant bends towards a light?). Active photosynthesis also assists the plant in the uptake of nutrients. 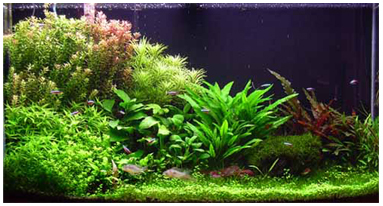 The easy pathway for aquatic plants to obtain CO 2 is when it is dissolved in water. The hard way is from the stripping of CO 2 from bicarbonate dissolved in the water. High levels of photosynthesis require an adequate level of CO 2 to maintain the process. If no CO 2 is added to an intense light situation, the bicarbonates will be stripped leaving a free -OH molecule to combine with free +H (making H 2 O) that was set free when carbonic acid (dissolved CO 2 ) dissociated. If there is another source of bicarbonate other then carbonic acid then +H made available from other acids will be removed from solution to compensate for the increase in -OH. When the +H is taken up like this the pH rises. By not adding CO 2 the pH swings in a limited body of water (aquarium) become quite large. Algae does not have a restriction on respiration during photosynthesis, when the plants start to slow down the photosynthetic pathways due to the lack of CO 2 , the uptake of nutrients also slows down. Algae take advantage of this situation taking up valuable nutrients while the higher plants are struggling for CO 2 . Algae bloom. 'Aquariums are a balancing act, if you can find the right balance of light and CO 2 addition then you should have an easier time maintaining a beautiful tank. If optimum growth is a goal you really need to cover the bases. If only good growth is a goal then you can do less intensive gardening, i.e. no CO 2 additions, under a moderate light source."